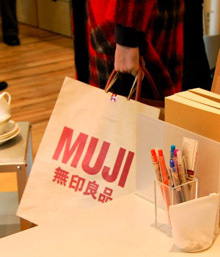 Those who can't live without their Japanese minimalist design fix will be most excited to hear that Muji have opened their very first outlet in Beijing. Their 372 square-meter store offers a wide selection of their trademark eco-friendly, high-quality, and well-designed household products, from toiletries to stationery, clothing, kitchenware and furniture. Prices are reasonable, and in line with international pricing. A transparent acrylic pencil box retails for RMB 20, a pack of 36 colored pencils costs RMB 128, and an aluminum card case is RMB 40. Whilst some might begrudge paying RMB 245 for Muji's porcelain teapot or RMB 160 for a simple compact umbrella, the draw here is clearly the brand itself, and fans will undoubtedly have a lot to enthuse about.